We came to this article refresh and noticed that all of our previous headphone choices stood up to scrutiny – hooray! So, we decided to add a few additional pairs to this chart. In came both the outstanding Pioneer DJ HRM-6 and the legendary Sennheiser HD 25. It’s time to take a look at some awesome sub-$200 headphones! We say awesome because the type of headphones you can get for around $200 these days usually combine eye-catching style, pro-grade performance and big value (which is pretty awesome!). These phones are significantly better than cans found in the $100 price range, and not that far behind those headphones that cost around $300. We have selected eight models, based on performance, features and comfort, while we favored models with a proven track record. Then stick around after the chart for a quick look at what to expect from headphones in this price range. Let’s get started. Bringing what is probably the best balance of performance, comfort and design. Velour ear pads, impressive performance across the range and plenty of definition. Elegant set that is perfect for both studio use and road use. Ultimate bang for the buck champion in this segment of the market. Awesome phones with monitor-grade accuracy on the move. One of the most interesting models that is also extremely DIY friendly. Simple yet versatile set that is backed up with plenty of accessories. Style, comfort and tone from this legendary set of cans. 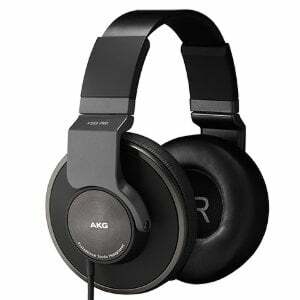 AKG offers a wide array of studio headphones that have been proven to work. What makes AKG K271 MkII stand out from the rest of their cousins, is the combination of performance and features they offer. To start things off, we have a simple yet effective design that makes adjusting the headphones super easy. On top of that, the sliding headband makes them extremely comfortable out of the box. Then there is the auto-mute feature and a compliment of cables that are the longest you will find in this price range. Last but not least, there's the performance. The amount of transparency, clinical accuracy and refinement in the tone is impressive to say the least. AKG K271 MkII simply rock. What Beyeredynamic DT-990 PRO offers is a compromise that optimizes performance and comfort on the account of aesthetics. Build quality, as questionable is it may seem at times, is actually pretty good. We are extremely happy that Beyerdynamics has decided to include velour ear pads with DT-990 PRO. This is the type of decision you won't see very often in this, nor higher segments of the market. The performance is balanced, somewhat biased, but ultimately transparent enough for proper studio use. Open back headphones are a little different in a sense that you have that spatial component, which is why we are letting that bias slide. If you are looking for proper studio headphones, Beyerdynamics DT-990 are most definitely it. AKG K553 PRO are by far some of the most stylish and best performing studio headphones you can grab in the lower mid range segment. Aside from their performance, AKG has managed to make K553 PRO extremely stylish in a price range which is still full of black plastic headphones. For that alone they deserve some extra points. Speaking of performance, things are looking great. Great response, plenty of transparency and an abundance of definition is what you can look forward to. Since the nominal impedance is set at a pretty low value, AKG K553 PRO can easily be used with mobile devices. Overall, if you're looking for something that hits a bit above its weight class, this is it. Audio Technica ATH M50x is definitely one of the best known studio headphones at the very edge of mid range segment. Not only did this entire series answer the need for an affordable product that works, but it really pushed other brands to start catching up. The defining characteristic of M50x is their performance. It is silky smooth, tight and fairly consistent across the frequency response range. The increased versatility made possible due to Audio Technica's pretty smart design, expands the type of applications you can use these for. Additionally, due to low nominal impedance, M50x has no issues working with mobile devices. This kind of performance, in a versatile package, at this price is just too good to ignore. This pair of DJ HRM-6s from Pioneer seem to receive less attention than some of the others on this list, but they have no reason to sit in the shadows – these are awesome cans! With a similar but higher-quality build to the lower-priced HRM-5s, this pair features an all-black design with adjustable stainless-steel headband and comfy memory foam padding on the earcups. Coming with three cables and packed with quality components, the sound replication is detailed and transparent. They make for perfect monitoring headphones for both in the studio or on the go. You can find more on the Pioneer HRM-6s in the full review. Fostex T50RP Mk3 are the latest iteration of a very successful model. They've fixed some issues previous models had, but also introduced a new character to the series. The end result are headphones which are unmistakeably meant for heavy use. Everything about them is fully utilitarian in nature, including the way the cable is plugged into them. When it comes to performance, Fostex could've ironed out the response a little in the highs. Even so, there is plenty potential left, making these ultimately a great choice for mixing. Finally, there is the modding aspect. Fostex T50RP Mk3 are very DIY friendly, just like its predecessors. Those interested in tinkering with their headphones can gain quite a bit by doing so. Shure's stake in the audio recording industry has been steadily growing over time. Aside from their microphones, studio headphones are one of the main culprits. Shure SRH840 belong to the lower mid range of that segment. As such, they have brought a somewhat different set of values to the market. Their performance is really up there when it comes to volume, clarity and transparency. The only thing lacking is a more engaging design. With that said, we can only be glad that Shure has decided to abandon aesthetics as a topic of interest. It doesn't take much to know that every producer out there will choose performance over aesthetics in a hear beat. Because of that, these deserve more recognition. Sennheiser’s HD 25s have been legends in the world of professional DJs for the last three decades and even in 2018 they show no signs of waning in popularity. While great for DJs, their noise-isolating, closed-back on-ear build and wide frequency range make them excellent for monitoring in a busy studio or loud environments. With an all-black design and ample soft padding, it’s a very stylish and comfortable pair too. The Plus set comes with a host of handy accessories including a hardshell case and an extra detachable cable. 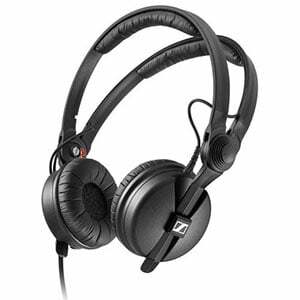 You can read more on the Sennheiser HD 25 in the full review. Comfort, along with performance, is by far the most important aspect of good studio headphones. Unlike commercial models, studio headphones are used for much longer periods of time and more frequently. Because of that, user fatigue needs to be at the bare minimum. The models listed above are all meeting that requirement. Even though in the grand scheme of things, $200 is still considered to be somewhat affordable, we start seeing some advanced design solutions which impact comfort. The first thing that comes to mind are velour ear pads. Anyone who has ever had to wear vinyl ear pads for any prolonged period of time, probably know how bad these can get. When you introduce velour, everything changes. Without exaggeration, just adding velour pads can make mediocre headphones into awesome ones. Often, headbands are much better in this price range too. The main reason being that many manufacturers use an external metallic rail instead of internal plastic inserts. This way, the actual headband slides along these rails, and is usually soft. Using this design greatly improves the chances that you can find a perfect headband setting for your head shape and size. Once we put performance and comfort to the side, there is an obvious improvement in this price range that has to do with the type of features these headphones bring to the table. The most obvious one is cables. Detachable cables are the standard in 99% of the cases. On top of that, the quality of cables is better with some brands using mini XLR connectors instead of your standard 1/8″ stereo jacks. Of course, this applies to the portion of the cable that goes into the headphones. Additionally, the length of the cables is more versatile as well. Not only will you see the standard 10 foot cables, but some brands offer 16 foot ones as well. Depending on the size of your studio and how you setup your gear, this may or may not be a key feature. While we are on the subject of cables, locking mechanisms are probably the most important addition. There’s an argument to be made against locking the cable in your headphones, but this is a matter of preference. Having the ability to do so is definitely a good thing. What really makes this segment awesome is the fact that most of these headphones come with great range of aftermarket parts. We are mainly referring to aftermarket ear pads and cables. When you think about it, what works for one user won’t always work for someone else. Having the ability to swap out components in order to boost the comfort of your new headphones can only be a good thing. Last but not least, there is the matter of build quality. Affordable headphones are often times lacking in this regard due to a simple fact that brands are trying to keep them as cheap as possible. That isn’t the case when you are paying $200 for a pair, which is only logical. Different manufacturers go with different materials and designs, but most of them are fairly rigid and durable enough. Even when you run into plastics, it won’t be that cheap brittle kind but rather a type of ABS that can withstand constant use. While a budget pair of phones have their appeal, going with a set of sub-$200 studio headphones is a great way to get started in the world of music production. In this price range you pretty much guarantee an awesome performance, proper comfort and durable designs at a price that isn’t going to drain your wallet. The models we have highlighted above are, in our opinion, some the best you can buy for this kind of money. The important thing to keep in mind is that some of these headphones might require additional equipment in order to achieve the best results (such as amplifiers and DACs). But, at the end of the day, it is definitely worth it.